Top Notch Material: Shimmer and Shine: Welcome to Zahramay Falls Releasing Tomorrow 8/16! Shimmer and Shine: Welcome to Zahramay Falls Releasing Tomorrow 8/16! Added to the list of new shows my son likes is Shimmer and Shine, and I have to agree with him. As a child of the '80s I grew up with Care Bears and Rainbow Bright and something about Shimmer and Shine brings back the nostalgia in me. My son loves it because it is bright, colorful and fun! My son says his absolute favorite part of the show is the magic cat! Either way, this is one show that we both agree on! 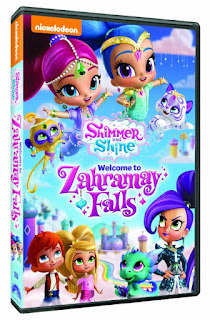 Welcome to Zahramay Falls - Shimmer and Shine receive a special Green Burst Gem from Princess Samira and bring it into the human world. The evil sorceress Zeta uses magic to steal the gem, but her spell goes awry and pulls Leah and Zac into Zahramay Falls.